A buddhist monk in a small, rundown village near Ha Noi suggested raising funds to build a playground, which has raised children's spirits since its installation. Thuy Dung reports. The first playground in the 13 villages in La Son District in Ha Nam was the idea of a Buddhist monk, who is a friend of most of the children there. The approach to An Ninh Village, 70km from Ha Noi, is a little depressing. There are green rice paddies and ponds teeming with ducks, but just two rundown shops to serve villagers. And the streets are covered with pebbles and bundles of drying grass. A big heap of rotting garbage sits on the edge of the village. But, beside the main pagoda in the village, Khanh Long, there is a space filled with piles of pallets, colourful tyres, swings, slides and other sporting facilities for children. The pallets have been arranged into a mini walkway for children. Sweating teenage boys swing from a rope tied to a wooden frame while their friends stood behind and pushed. 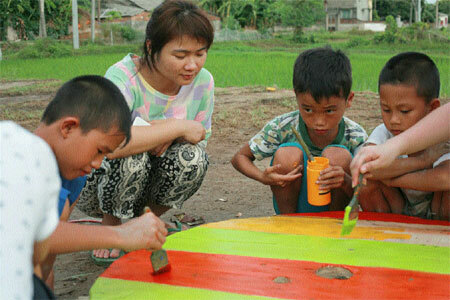 The playground was inspired by a Buddhist monk who noticed that villages in the area had no facilities for children. 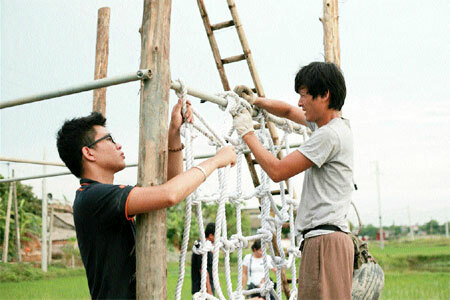 In An Ninh, villagers were too poor to be able to afford a playground. "Parents have enough trouble insuring their families' day-to-day survival," said Nguyen Phuong Hoa, owner of the only drink stall in the village. Before the playground was built, boys would ride their family's water-buffalo around rice fields to have a bit of fun. "Before, we usually gathered and found our own ways to create a game for all, or we would all go for a swim in the pond, especially in summer," said eight-year-old Pham Khanh Toan. Aware of the need for playing spaces, Thich Tam Tue, a Buddhist monk from Khanh Long Pagoda came up with the idea of building a playground in a public yard nearby. "Watching children wandering around with no place to play, I recommended building a playground to Phan Vinh, a layman who approached many organisations to fund the project," he said. Part of the process: Children help the team decorate the facilities. Think Playground Group, a team of young volunteers working on playground plans throughout Viet Nam pursued the funding on Facebook as well. The monk said he loved to spend his spare time talking with teenagers. "On the weekends, I attempt to teach them either life-experience skills or common knowledge they have not acquired at school. Sometimes, I give them food, listening to their dreams and expectations." It took the team two months to design and build the playground. The monk persuaded local authorities to back the proposal. "Despite low economic level, the community always strives to create better conditions for kids here," he said. "After the ground was completed, I spent several weeks observing how children enjoyed it. They were delighted. I was surprised to see them there even during the heat of the day." "It was raining when the team set up the last playing equipment," said Nguyen Tien Phong, chief architect of the project. "But the kids were excited and helped decorate the tyres."